Faster than a speeding bullet a female peregrine falcon dove off the Huntington Bank Building, accelerating only feet away from its vertical edge. It was a daredevil move and it worked. The pigeons loafing far below were shocked out of their daydreams and bolted off the window ledges. Her new mate joined the fray in an impressive display of co-operative hunting. What a team! 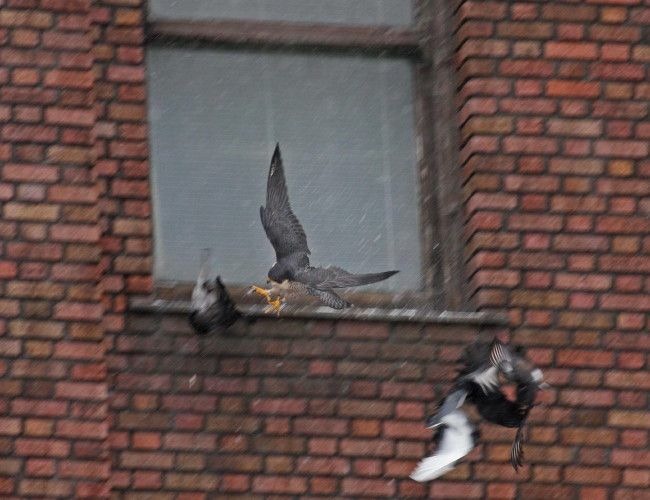 Teamwork is part of peregrine courtship because it takes the dedication of both adults to raise a brood of nestlings. 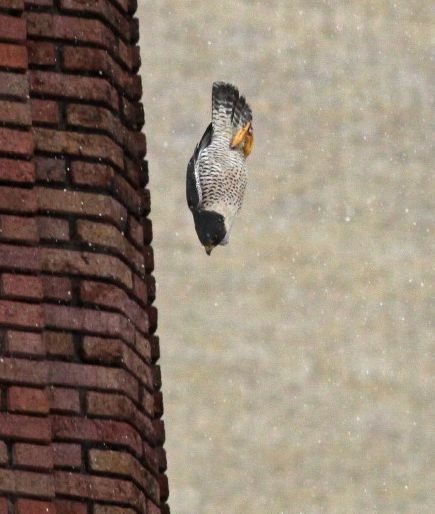 Before they nest, peregrines cement their pair bond and practice teamwork by chasing off threats (hawks, owls and vultures) and by hunting co-operatively. During the hunt, one member of the pair rouses the prey and the other helps chase for the kill. Sometimes it looks as if they are herding pigeons. On rare occasions I’ve witnessed this action at Pitt, but it’s difficult to see with limited sight lines among the buildings. Chad and Chris Saladin were lucky to be there when SW and her new mate, Ranger, showed off their skills in Downtown Cleveland on New Years Day 2010. And what did it look like when the pigeons scattered? Click SW’s photo to see. Hey, you pigeons! Watch out below! Wow, that is an amazing picture! comments. The consistancy of nature. Whoa!! What a moment and what a capture!! Thanks to you for sharing and the photographers for their quickness.